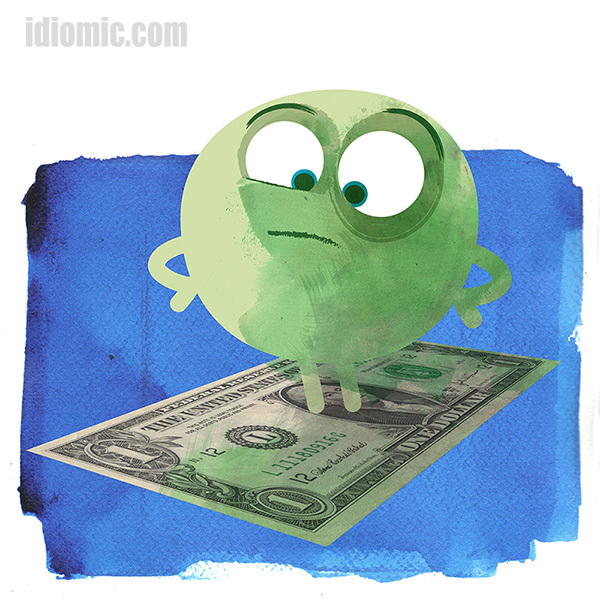 'On the money ' illustrated at Idiomic.com: definition, example, and origin. Example: Kevin’s frisbee throw was on the money. It was a shame that Lennie wasn’t looking at the time. The doctor told Lennie to come back on Thursday to have the stitches removed. ‘On the money’, or ‘right on the money’ as it also often expressed, is among several idioms about exactitude. There’s ‘on the mark’, ‘on target‘, ‘on the dot’, and ‘spot on‘ to name a few. Those idioms probably have roots in archery. They all express hitting the centre of a target which is usually marked with a spot or mark. ‘On the money’ does not come from the same root. Most sources agree it has to do with horse racing, specifically the related bets. A winning horse would be ‘on the money‘. A losing one would be ‘out of the money‘. Iddy has heard one other explanation, that it has to do with surveying. Surveyors sometimes hammer a metal ‘benchmark’ rod into the ground at a precisely defined position. Sometimes these rods are difficult to see through the viewfinder of their transit (the viewing equipment on a tripod you will have seen surveyors using). A coin placed atop the benchmark would make the rod easier to see. So, when they lined up the coin in their viewfinder, they would be ‘on the money’. Iddy doesn’t know if there is any truth in that one, but he likes it anyway. Right now he’s trying to figure out which shop would accept the giant note he’s found….